Call WA external solutions for all your guttering needs, 1300 660 978 and speak to one of our friendly team and organise an obligation free quote. We cover all of the south-west for roofing needs so if your needs are in the roofing market then call us for a free quote. We cover from Perth, including Mandurah, Falcon, Yunderup’s, Ravenswood, we even have done roof restorations in North Pinjarra or Carcoola if you you prefer. 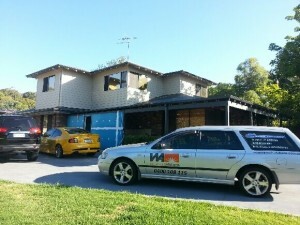 We are qualified, trained, friendly and family owned that gives you real peace of mind. The services we offer apart from Gutters and Downpipes include roofing, so we can change your roof from tiles, asbestos or tin to Colorbond or Unicote, we can restore your roof or if you like paint your roof, put up a patio both in metal or timber, lined or not, colorbond fences and gates, Vinyl wall cladding, or even james hardie linea if you prefer. We also operate in all of the South West including Dunsborough, Margaret River, Donnybrook, Manjimup, Bridgetown, and of course our home town of Busselton.